We’ve just updated our popular and free iMedia Browser to version 1.2.2. The main new feature of this update is compatibility with Apple’s new Aperture 3 update, including an ability to browse videos in the Aperture Library. We would like to extend a Merci Beaucoup to Houdah Software (makers of the ever-useful HoudahSpot and HoudahGeo) for updating the open-source component of iMedia Browser to make this update possible so quickly after the release of Aperture 3. This update also works around a known issue with Apple’s iPhoto library file in which certain kinds of slide shows would prevent iMedia from reading the entire library; it also fixes a minor memory usage issue. We’ve been working on a project for several months that is almost ready! It’s a series of nineteen videos that walk you through all aspects of creating and publishing a website with Sandvox. The training course runs for a total of two and a half hours; it shows you how to set up your website; add pages, pagelets, and collections; tweak your site with the inspector; and publish it. It also covers advanced Sandvox Pro topics such as integrating with Google and adding in custom HTML code. We think this course has something for everyone, from the novice just getting started to the experienced Sandvoxer! We will be sending out an announcement to this list in a couple of weeks, with a special introductory price, before we make the training available to the rest of the world. Watch your in-box for details. If you are a Mac user, you are probably interested in trying out new applications that will make you more productive, or make your life or your job easier, or that put a smile on your face. Here is a list of eleven free Mac applications that we think are really cool; some of these are old favorites and others are recent discoveries. Check them out if they sound like they might be useful. If you like to easily rate, and see stars ratings for songs in your iTunes library, get I Love Stars. It puts a star-rating control right in your menu bar so you can rate songs as they are playing. If you travel a lot and find it’s tedious to switch time zones on your Mac, you will want to download JetLag. It checks your location via WiFi and automatically updates your system clock and your iCal time zone. If you are wondering what is taking up so much room on your hard drive, check out GrandPerspective. It shows you a graphical “Tree map” of the contents of your hard disk (or a specific folder). It’s handy to have a visual overview of your hard drive, so you can delete or archive the files you don’t really need. Translate Text is a simple application that uses Google’s translation engine to quickly translate a chunk of text between languages. It is very handy (though a bit awkward to set up) when set up as a contextual menu tool. Never again will you have to go digging for a tool to translate text in another language into something that (mostly) makes sense! Growl is a handy utility that lets your applications communicate with you when they have something to announce. Many applications integrate with Growl. Sandvox, for instance, works with Growl to notify you when it has finished publishing your document. Work with multiple instant messenger accounts? Adium merges them into a single unified contact list for easier and more efficient working than iChat. It also features lots of extra advanced tweaks to apply, plus theming controls. If you find yourself needing to make use of online videos that QuickTime cannot play, Perian may be the tool you need. It adds support for a number of other video formats so you can play them with QuickTime. Acorn, normally a paid application, has a free mode that allows a lot of basic processing on images, such as cropping, filtering, rotating, resizing, adding text, and touching up images. If you need to do just basic image manipulation, the free version of Acorn might be all you need. If you need to make sure your Mac stays awake, not dimming or disabling the screen for a while, install Caffeine and just click on the icon of the coffee cup in your menu bar. If you want to create screenshots of your website — especially when they scroll longer than will fit onto your window, if the page is long — check out Paparazzi! We use it all the time. If you have multiple computers and want to share files between them, or perhaps you work with other people and share documents with other Macs (or even PCs), Dropbox is indispensable. It’s free for up to 2 gigabytes of storage (this referral link will actually get you an extra 250 MB), with paid options for more. We’ve heard of people using Dropbox to share a Sandvox document across multiple computers. It’s is also handy for sending large files; just put a file in your Dropbox folder and control-click on the icon to generate a URL you can share with somebody to download your file. If you use any “must-have” free applications, reply to this message and we’ll add them to our list of ideas for items to feature in some other issue! This is the latest in our new monthly feature for our newsletter, spotlighting a few Sandvox-created websites that we think show off the application’s features well. We hope these examples will give you some inspiration for your own Sandvox site! 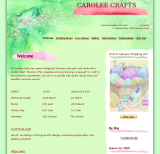 Caroline Nash, of Hampshire, UK, used Sandvox Pro to build “Carolee Crafts” for her business of victorian and vintage gifts and cards. She chose the watercolor-themed “Branching Out” design for the website because the feminine colors and design suited her business. The site makes use of a number of Sandvox features, including multiple instances of the contact form (for general inquiries, newsletter subscriptions, and quotes for bespoke items; list of links; photo albums and photo pages to showcase her products; and more. She uses Raw HTML to embed PayPal buttons for ordering online. This is a great application of Sandvox! Dr. Boulat Rafikov, of Lobito, Angola, has created a number of websites with Sandvox, including this month’s featured Me2Everyone for the Boulat Network. His website is a gateway to what he describes as “a new CyberWorld owned by members.” The website makes use of RSS feed pagelets to keep the site up-to-date; the site also uses rich text, raw HTML elements, contact forms, and so on. Douglas Nikkila, of Accord, New York, created a simple yet effective website showcasing his woodworking talent. 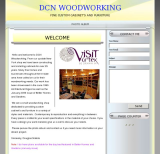 The website, DCN Woodworking, built with the “Starburst” designs (one of our favorites), isn’t large, but it contains everything he needs: an introduction, a way to contact him, and plenty of photos!